Spotify announced some minor updates to its Premium experience on mobile. The developments are mostly centered on providing an easier and more personalized experience of the app. The updates begin rolling out globally across iOS and Android apps today. First, the navigation process has been updated in a move to make it faster and simpler for a listener to find what they are looking for. The navigation bar now has just three options: Home, Search, and Your Library. Second, the search page has been redesigned to encourage more discovery. A section of the listener’s top genres has now been added to the top of the screen before a query has even been entered. 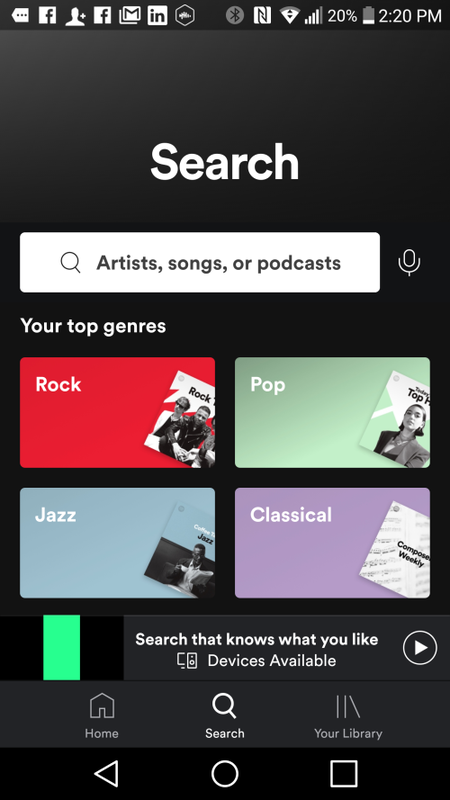 This page now incorporates some similar features to the old Browse section, including links to popular curated playlists. The simpler navigation seems good to us, as Home and Browse were confusingly similar. With the Browse features rolled into the redesigned Search page, the whole activity of finding content is sensibly consolidated. Finally, Spotify has added a new Endless Artist Radio option. These playlists will deliver a continual stream of music based on a combination of the seed performer and the listener’s own specific tastes. These stations are regularly updated and can be downloaded for offline access.